Silvan Australia has released the Smoothflo Squatpak, a spray system designed to manage noxious weeds and growths in hard-to-reach place like gullies, under fence lines, in tree plantations and on roadside verges. The Smoothflo Squatpak is a 300-litre spray unit combination that comes equipped with a 12V electric pressure pump and the buyer’s choice of hose reel. Due to its accurate spray applications, Silvan says the Smoothflo Squatpak sprayer is suitable for local government facility managers, farm owners and rural lifestyle property owners. The unit has an impact resistant, ultra violet stabilised Polytuff tank which is fitted with an internal baffle and a drain plug for draining and cleaning when finished. A readily adjustable atomising spray gun is also provided for a variety of different spray streams. 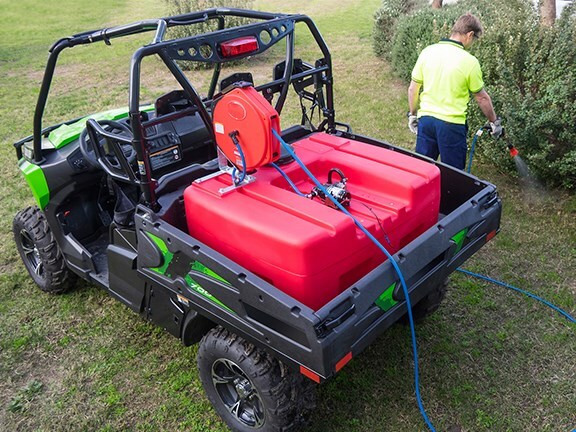 Size wise, the Smoothflo Squatpak measures in at 1050mm long, 580mm high and 1010mm wide, which Silvan says makes the spray system ideal to carry on a ute or UTV. The Polytuff tank has a dry weight of 27.5kg. The Silvan Smoothflo Squatpak requires a vehicles 12V power supply for its Aquatec DDP 552 series pump that includes an auto bypass, a pressure sensing switch with adaptive pressure sensing mechanism, that dampen changes in pressure to eliminate pulsation. The Aquatec pump is able to provide 7 lpm open flow or 120 psi working pressure. The unit comes with a power cable and alligator clips for attachment to the vehicle in use. Silvan offers a 30m hand-wind-up hose reel or a 15m swivelling spring retraction hose reel, which is ideal for spraying from a vehicle in motion along defined areas, like driveways, plantations, beneath fence lines or roadsides. Each hose reel come fitted with a locking mechanism to hold the hose in place or to secure or wound tight for travelling. The Silvan Smoothflo Squatpak spray unit comes at a cost of $1,439 and is available through Silvan Australia’s authorised dealer network.